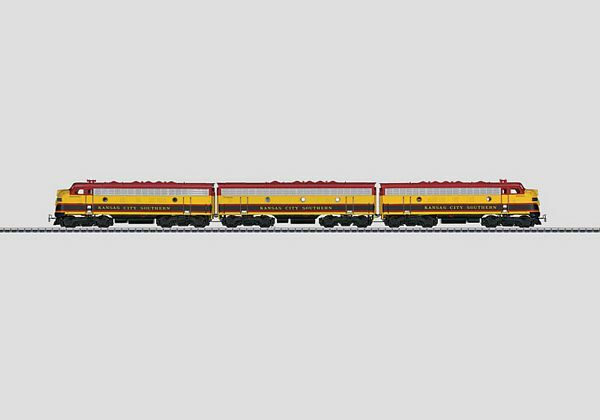 Prototypes: Kansas City Southern General Motors EMD class F7. Three unit locomotive consisting of an A unit, B unit, and an A unit. Model: The locomotive has an mfx digital decoder and extensive sound functions. It also has 1 motor in each A unit and a speaker built into the B unit. 2 axles powered in each A unit. Traction tires. The headlights and lighted number boards will work in conventional operation and can be controlled digitally. The locomotive has a sound generator with diesel locomotive operating sounds. There is a permanent drawbar between all of the locomotive units. Snow plows for installation on the locomotive are included. Length 52 cm / 20-1/2in. Headlight(s) . _ . _ . .
Operating sounds . _ . _ . .
Bell . _ . _ . . Direct control . _ . _ . .
Sound of squealing brakes off _ _ . _ . .
Low Pitch Horn _ _ . _ . .
Whistle for switching maneuver _ _ . _ . . Letting off Air _ _ . _ . .
Sound of Couplers Engaging _ _ _ _ . .
Rail Joints _ _ _ _ . .
Cab Radio _ _ _ _ . .